Prominent & Leading Exporter from Mumbai, we offer aluminised suit, fire aluminized proximity suit, furnace aluminised suit and flame retardant aluminised suit. Temperature (Degree Celsius) UP TO 1000 TO 1200 DEG. CENT. RADIANT HEAT. Made out of multiple layers. b) A hood with visor and inbuilt HDP helmet. d) A boot with leather lining, anti skid design Neoprene rubber sole, zip fastener. Size of boot 7 or 8,or 9 and height will be approximately 7"
Weight of complete suit will be approximately 08-10 kgs. Commercial Grade IM: Made from fabrics certified by EN ISO 11612. Heat Resistant 800-1000 degree celcious. 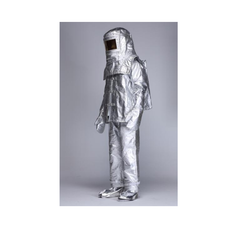 Fire Aluminized Proximity Suit is designed for rescue operations and places where there are hazards and people operating in excessive temperature ranging 800-1000 degree Celsius. 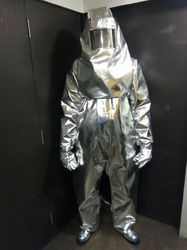 The outer layer of these aluminized suit being aluminized helps to reflect more than 90% heat thereby helping the rescuer to prolong the stay near fire comfortably. 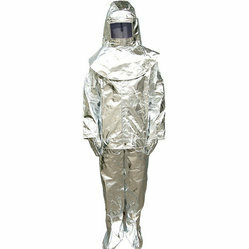 Fire Aluminized Proximity Suit is made out of 16 oz imported aluminized glass fiber fabric with a dual mirror having 90% reflection of heat as an outer layer and with woolen fabric lining. The additional layer (vapor barrier) is also used for higher temperature. Outer fabrics tested and approved by defense institute for fire research new Delhi & field tests performed by defence-Indian navy NBC school, ins Shivaji. Lonavla Maharashtra. 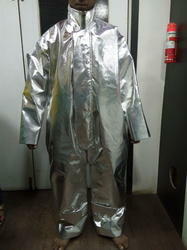 We are leading supplier of Furnace Aluminised Suit. We have two different variety layers in this suit. A hood with visor and inbuilt HDPE Helmet. A pair of five-finger gloves. A pair of boots with leather lining, anti-skid design Neoprene rubber sole, zip fastener. We are leading supplier of Flame Retardant Aluminised Suit. Outer Layer: Outer layer is made up of 430 gsm Commercial Grade Aluminised Glass fibre fabric. A hood with visor and inbuilt HDP helmet. A boot with leather lining, anti-skid design Neoprene rubber sole, zip fastener. Size of boot 7, 8, 9 and height will be approximately 7"